It is a fascinating new theory that could change our understanding of this icy dwarf planet at the edge of the solar system. Pluto has been one of the solar system’s most fascinating bodies, thanks to the passionate debate over whether it is even a planet and a recent flyby by NASA’s New Horizons spacecraft that showed the dwarf in stunning detail. But a new study is really adding an interesting twist to our understand of Pluto, claiming that this dwarf planet may actually be a giant comet. The remarkable new study from scientists at the Southwest Research Institute uses data from New Horizons as well as Rosetta to suggest that the dwarf planet may have been created by the collision of a billion comets. The findings, published in the journal Icarus, focuses on an area on Pluto called Sputnik Planitia which has the chemical composition that seems to match up very well with Comet 67P, the comet that the Rosetta spacecraft famously landed on a few years back. The Rosetta spacecraft studied the comet for more than two years and sent back an incredible amount of data. It allowed researchers to compare the chemical composition of the comet with that of what we had learned about Pluto’s composition thanks to New Horizons’ 2015 flyby. And surprisingly, everything appears to match up. That just leaves the question of how exactly this happened. It may have been caused by about a billion comets or other Kuiper Belt objects similar to 67P. However, there are still many questions to be answered, but it opens a new intriguing area of research for scientists and astronomers. 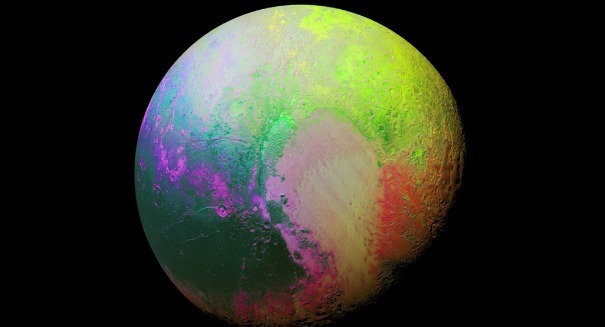 Scientists also investigated a solar model that would have involved Pluto forming from ices that would have had a chemical composition that is more similar to the sun.